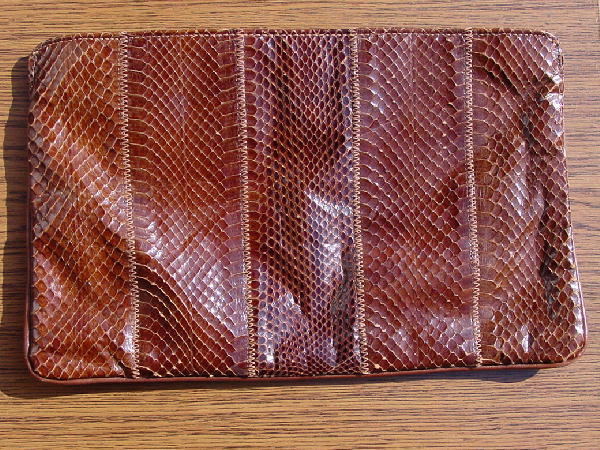 This vintage snakeskin clutch is in an auburn-brown and a light chocolate brown. It has a top zipper and two interior pockets, one of which zips. There is a nice heavy fabric brown lining. You could add a chain and carry it as a handbag or shoulder bag. We like it as a clutch. Each side has 5 panels with vertical stitching in between. A European model wore this with the Apple Accessories snakeskin belt.